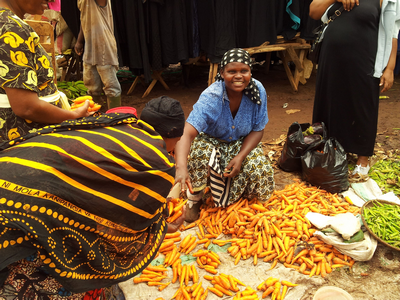 Safine has a stall in the bustling market at Boma Ng’ombe. She sells carrots, buying in bulk from the wholesalers and selling to regular customers. Her sister, Evaline, helps her on Sundays when the market is at its busiest. Safine also sells in a neighbouring market one day a week. Before receiving her grant, the family had no independent income as Safine was widowed when her husband died of an HIV related illness. The family were living on 1-2 meals a day, some of which was donated by neighbours. They now eat three meals a day and live in a safe house. Her two young children are at primary school and doing well. Safine plans to take out a top up loan shortly to enable her to extend her operation to another nearby market. If you would like to help support more women like Safine, we are currently raising funds for our next round of grants and loans. To help us achieve our target you can donate here.